Autodesk Subscription: Not just a guaranteed annual upgrade. We all know the value of maintaining your subscription. It helps you to avoid the pain of paying for a new version each time you upgrade. Especially with the new Autodesk upgrade pricing, Autodesk Subscription benefits are imperative in order to keep up with ever-changing technology. You also have the option to continue using previous versions as needed. But what else can this contract do for you? And how can it help you manage your assets? Manage your assets: Most obvious to those who work with this benefit is the easy management of seeing all your assets in one place, and being able to download as you need them (system crash, anyone?). Before any action can be taken, you need to log into your personal Subscription Center using your user ID and password. Once logged in, a whole world of options is opened up for you. Do you need a 2008 version to accommodate a client who hasn’t upgraded? Still not a problem. Although the standard download options do not include a version this old, you are able to request a previous version license from Autodesk. Online Tutorials and Trainng: Interested in checking out the enhanced features of the newest release? Looking for some pointers on how to use the newer versions? Get access to self-help content from the “Training” link. It’s time to start exploring your options! Subscription Access Levels: There are several access levels within the center. It starts with the Contract Manager, who has access to all the assets within the Subscription. There is also a Subscription Coordinator, whose access is limited to the specific serial numbers assigned by the Contract Manager. You can do this under Contract Administration. 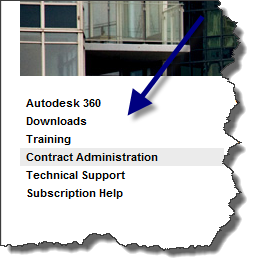 Contract Adminstration: From this tab, you can control access to the Subscription Center for all your system users. This includes giving users other than the Subscription Coordinator full or modified access to benefits. For instance, you can give them the ability to download any of the software on your subscription or just to the E-learing pages. You can get a full report of your subscription assets in Contract Administration. This includes the number of seats per license and their product keys. You can also view the deployment (standalone or networked) and the name of the Subscription Coordinator. This view is also helpful for checking the group names assigned to your assets (if you use this optional designation). See a tutorial on Contract Adminsitration. Home Use Licenses: Do you have users who whould benefit from the option to work from home? As part of your Autodesk Subscription, you can obtain home use licenses for the users who need them. The link to request this option is also within the Contract Administration portal. Autodesk 360: Autodesk Subscription also increases the value of Autodesk 360 for Suites customers. With a Design Suite Subscription, users are given more storage space and Autodesk credits for rendering, simulating and analysis in the Autodesk cloud-based platform for virtually unlimited computing power without bogging down your hardware. Autodesk 360 increases your productivity with collaboration and mobile tools. Learn more. This is just a taste of what Autodesk Subscription has to offer you. It looks like it’s an even better value than you thought, doesn’t it? 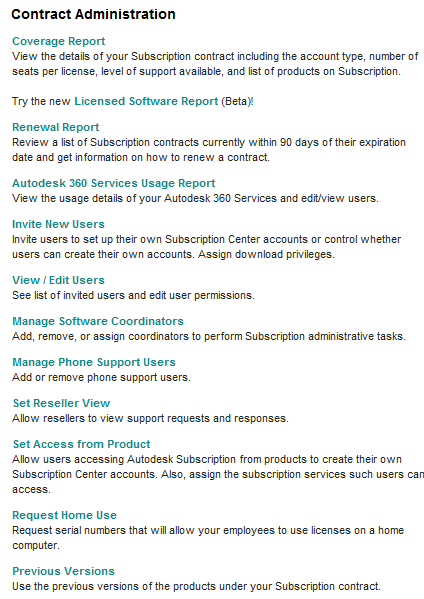 Learn more about Autodesk Subscription on the Autodesk Site or a through a short Autodesk Guide. Synergis is always here to help you, too. Any questions about the center, and all of your other Autodesk benefits, feel free to contact us and we can walk you through it. Contact us by email or phone (800.836.5440), or see the Synergis Website.